This Valentine’s card, below, by the French artist Xavier Sager was posted from Finland in 1917 to an address in Norway. It is priced at £15 from Val Jackson-Harris, a dealer in printed ephemera from the 18th-19th and early 20th centuries. Valentine's card by French artist Xavier Sager sent from Finland to Norway in 1917, priced at £15 from dealer Val Jackson-Harris. 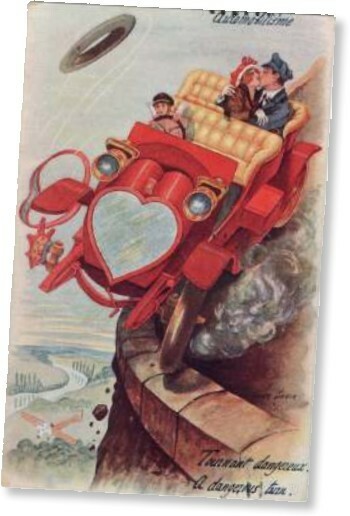 Tournant dangereux (a dangerous turn) shows one of the roadster’s wheels coming off on a mountain road as the happy couple kiss in the back seat entirely unaware of the danger - as is maybe the wildly grinning driver. The first of the society’s biannual ephemera fairs is on Sunday, June 2, in central London. Jeremy Cooper started a postcard collection when he was a student hitchhiking around Italy in the 1960s – they were an affordable way of collecting images of 14th century art. His interest in this age-old form of ephemera continued and years later, when working as an antiques dealer, he became interested in postcards created by contemporary artists. Cooper, a former auctioneer at Sotheby’s, has spent a decade collecting postcards by artists such as Jeremy Deller, Gavin Turk and Gilbert & George. He has donated 1000 to the British Museum, where they are now on display until August 4 in Room 90 (free entry). More than 300 also appear in an associated book with the title The World Exists to Be Put on a Postcard: Postcards from 1960 to Now, published by Thames & Hudson.